Inspy Romance readers–we are halfway through the week. Yay! Lindi here, bringing you your midweek post, your hump day post, your we’re heading for the weekend post. I love Wednesdays because it’s Bible study day. :) So question 1 for today–why do you like Wednesday? 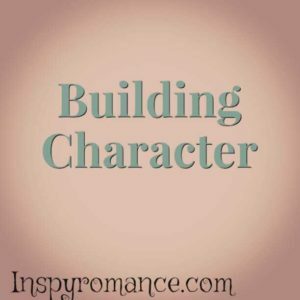 Today we’re chatting about building character. Yes, character and characters. Because all characters need character, right? For our heros and heroines we want them to have good character. And those are the traits we want to have as well, right? So, when building a character we want to build them with good characteristics. But sometimes our heros and heroines have to grow into these “good” characteristics. I remember writing my book, Her Best Catch, and my heroine, Allison, was rolling along in life as a reactor instead of an initiator. She let the circumstances of her life dictate her response to life. Her “character arc” was to grow into a women who could take hold of life and lean into it on her terms instead of reacting to what was happening around her. Before the book was bought by Belle Books for publication I entered the manuscript in several contests. I either finaled or tanked. A lot of the feedback I received indicated my heroine was weak, I needed to make her stronger. But wasn’t that what I was doing as the book went along? Granted, the judges only saw a first chapter and sometimes no synopsis, but I couldn’t figure out how to make her stronger and have her be the same character I had envisioned and written the book around. I found I had to fine tune building her character with characteristics that made her stronger. I hinted at it sooner, and made sure she was motivated well to be not as strong in the beginning. In looking back on my journey in life, I’m sure Allison is a hint of myself. I was always a crowd follower. I had a lot of friends, and I loved doing what they were doing. Sometimes, it wasn’t even my thing, but I went along with it. I guess I was a late bloomer. It took me a while to come into who I was. That didn’t happen until I was a Christian. When I saw who I was in God, well, that can change a story, can’t it? It didn’t happen overnight, it’s still a work in progress, but that’s okay. We don’t want to read about characters who never change or grow. If they kept the same faults and same mindsets the stories wouldn’t have the ah-ha moments, the realization moments. The moments that resonate with readers are moments where the characters have come into who we knew they could be. So, building character in our characters is a journey. One that we’ve often walked and lived out. I’d love to hear one (or more) of a character journey that has impacted you or one that you loved reading. I’d love to give an e-version of Her Best Catch to one commenter. Hi Lindi, Her best Catch was the first book of yours I read:) I appreciate your thoughts- so true that we continue to grow in character as we walk with God. I a deeply thankful that He accepts works in progress!! Hmm, a character that stands out to me is that of Rachel from Brock and Bodie Theone’s Zion Series. I remember reading that series as a teenager and Rachel had a lasting impact on me- someone separated from her family by the Nazis, abused at will, then shunned by other Jews because of her wartime experience, fragile, yet determined to find her remaining family in Jerusalem to being shown love by Moshe. Ahhh, beautiful! Hi Wemble—i love that the character has stood out to you since you were a teen. For all writers, that’s our dream. To create characters that leave life long lasting impacts. And yes, God is amazing! A character’s journey that stood out to me on a personal level would have to be Chelsea Riehl from Valerie Comer’s Plum Upside Down. I can totally relate to her journey as being much like my own, growing up in a Christian environment but not relating God’s love to me personally. The journey and the Bible verses still help me to this day! Paula—Yay for a shout out to our own Valerie. I can’t relate to also to growing up in an Christian environment yet not relating to God’s love. Sounds like a great character. We all need this book on our TBR pile if we haven’t read it. Hi Lindi! Love Wednesday because it is a short day watching grandchildren. Also today having dinner with a friend before we go to book club. As an avid reader with so many wonderful stories and characters, it is difficult to remember them all. As a teen Christy by Catherine Marshal inspired me, since I wanted to be a teacher. The hardships pioneers and especially women overcame, so that I could follow my dream not only to be a teacher, but to work and be married and have a family! Best wishes! Book club! Yay. I also loved Christy. :) thank you for reminding me of that amazing book. Lindi, I’m working on building character in a leading female right now, as I’m about to dive into the writing of a new book in July for Camp NaNoWriMo. This is a book I’ve already written 13k words in, but the leading lady is having difficulty popping back into my mind. I’m hoping that a little exploration of what I already wrote will help and that I’ll be able to sort out the reasons why she isn’t standing out to me. Andrea.. happy writing to you! I find in that situation sometimes the more I write the clearer things become. Hi Lindi, I love taking a bad girl, non believer and introducing her to Jesus. I always wish I could make real people do what I want them to or what they need to do the way my characters do. In the end, I can only hope that a reader sees themselves in one of my characters and decides to make a change. Shannon… I’m the same way. I love having characters meet Jesus! And I love writing men who love Jesus. Sophie/Alex in sophie’s heart by Lori Wick. She came from another country to help this family out after the loss of a family member. She helped the family out in different ways and they ended up healing and growing stronger as a family,and the result was Sophie/Alex marrying each other, her grandmother coming to america, and Sophie having twins.